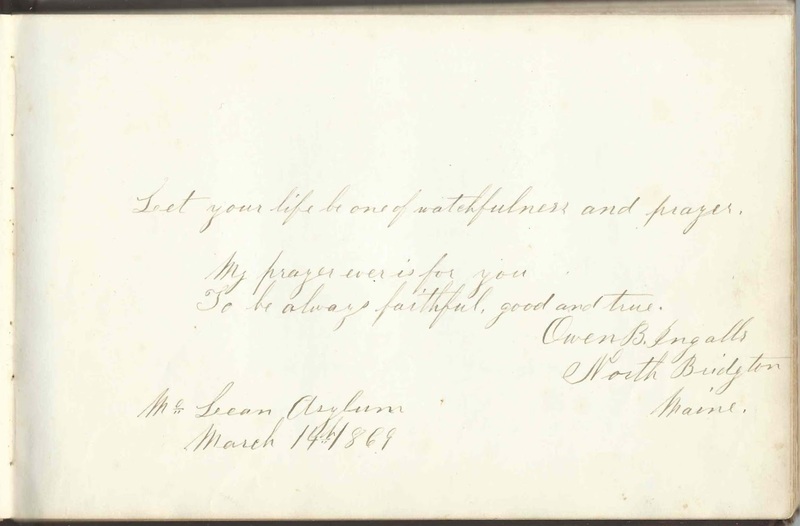 1850-1868 autograph album that belonged to Lois Lewellyn Meriam of Winchendon, Massachusetts, before and after her 1851 marriage to Elbridge Nelson Harris. 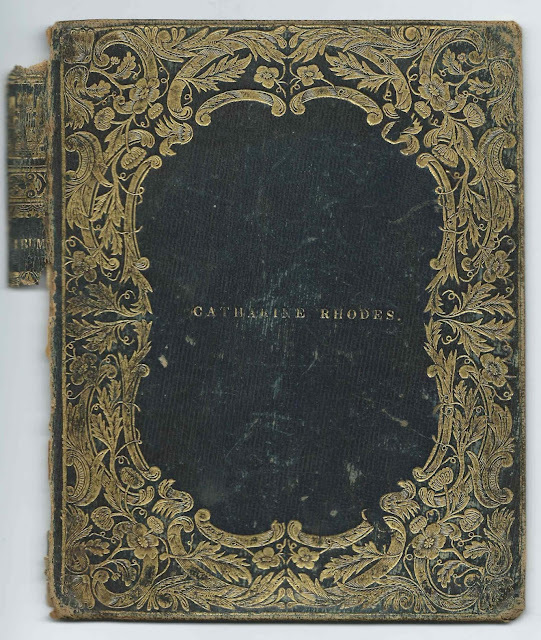 The album, published by J. C. Riker of 129 Fulton Street, New York, measures approximately 7-3/4" x 6" and contains the sentiments of over 20 of Lois Lewellyn (Meriam) Harris' relatives and friends. An alphabetical surname list and an alphabetical list of the signers, together with any personal information they offered, appears at the end of this post. 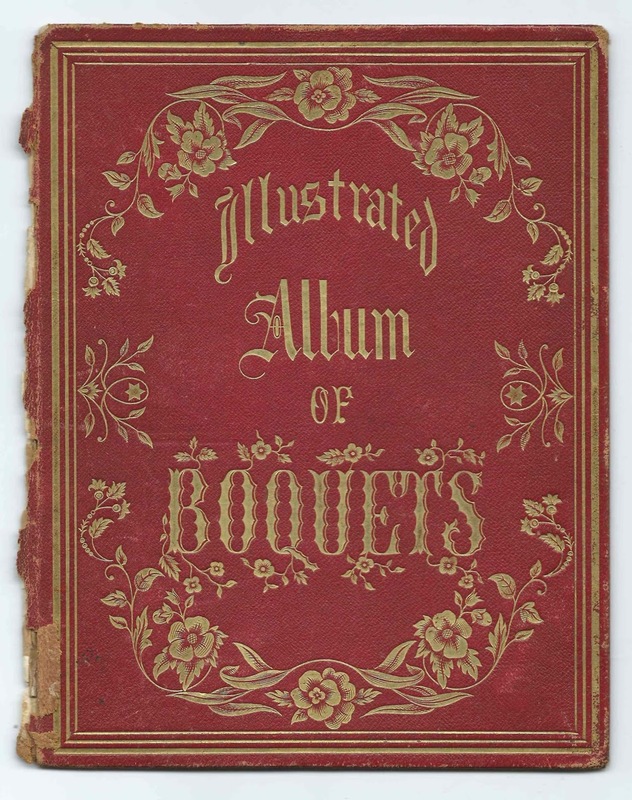 The album also contains six small hand-colored floral, fruit and bird designs at the tops of pages that are meant for inscriptions. Lois Lewellyn Meriam was born August 6, 1828 at Princeton, Massachusetts, the daughter of Joseph and Ruth (Harrington) Meriam. Many of the pages are inscribed to "Lewellyn", so that is apparently the name she chose to go by. Lewellyn had nine siblings, I believe, but several of them died young. 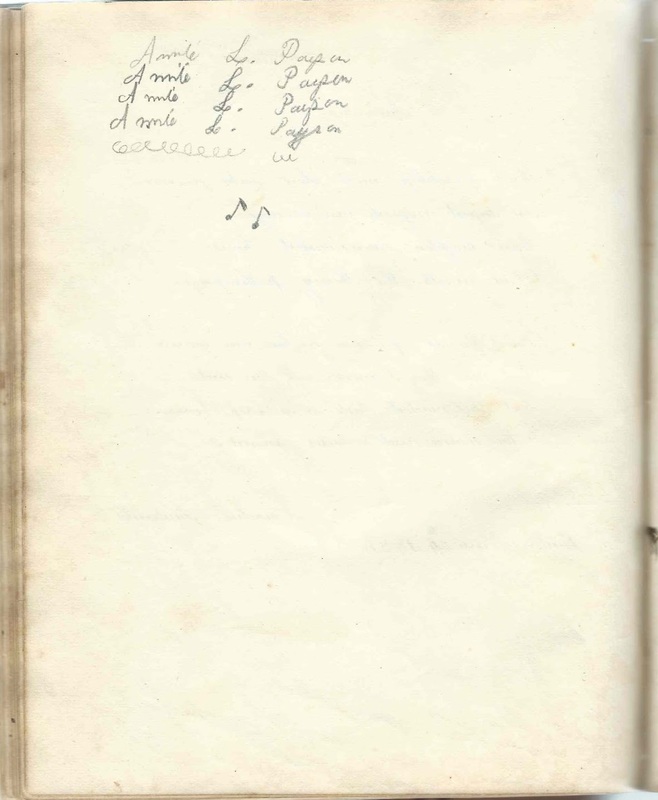 Several siblings inscribed pages in the album; see the list of signers below. One was sister Mary Maria (Meriam) Wyman, whose page also illustrates one of the hand-colored designs. Mary's husband was William H. Wyman; their daughters Nellie and Emma also inscribed pages in the album. On March 19, 1851, Lewellyn married Elbridge Nelson Harris, son of William Harris, Jr., and Hepsibeth (Flint) Harris. 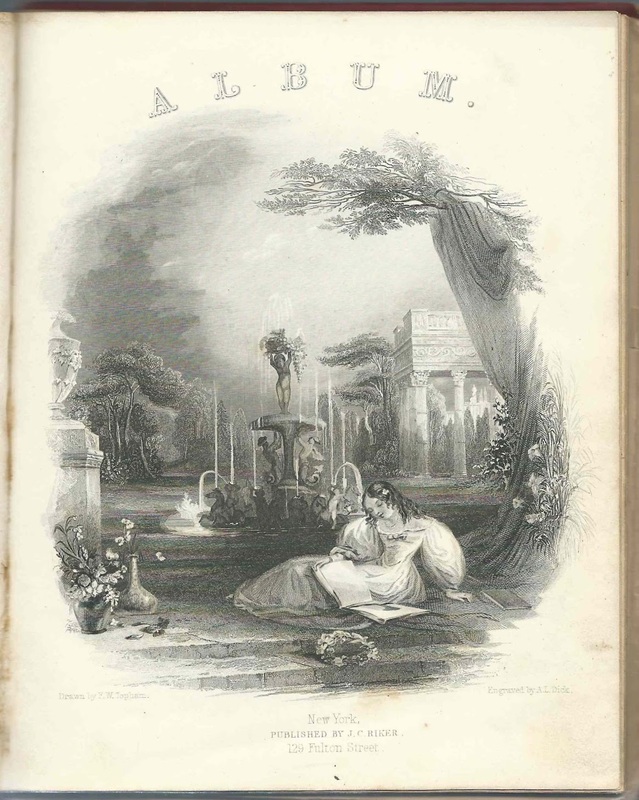 The N. E. Harris and E. Nelson who inscribed pages in Lewellyn's album were presumably her husband Elbridge Nelson Harris. One of the sentiments, a two-page sentiment, he entered two dates, one, 1850, before their marriage, and another, 1855, after. Elbridge Nason Harris died in 1906, and Lois Lewellyn (Meriam) Harris in 1924. 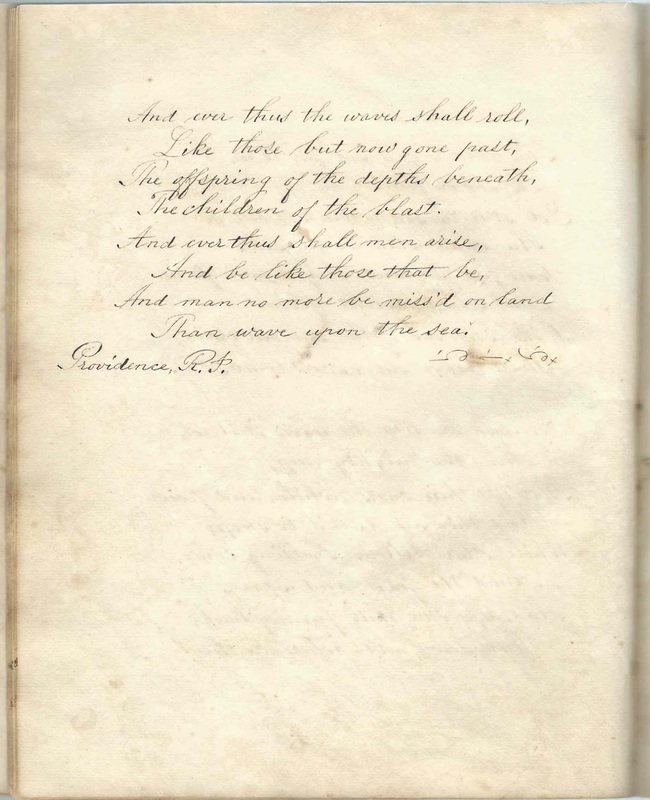 Sentiment covering facing pages, inscribed to Lewellyn by E. Nelson at Clinton, Massachusetts, on June 23, 1855. Possibly Lois Lewellyn (Meriam) Harris's husband Elbridge Nelson Harris, who inscribed pages before and after their 1851 marriage. Lizzie S. Chaplin of Salem, Massachusetts, signed on September 5, 1868; "Your Sister". She was Susan Elizabeth (Meriam) Chaplin, wife of Orril R. Chaplin. N. E. Harris, presumably Elbridge Nelson Harris, husband of album owner Lois Lewellyn (Meriam) Harris. He apparently went by the name Nelson. Inscribed to "My Sister" by Walton G. Meriam, at Winchendon, Massachusetts, on September 1, 1850. He was Walton Greenough Meriam (1838-1920), son of Joseph and Ruth Meriam and brother of album owner Lois Lewellyn Meriam. 3 page Dedication by Llewellyn's cousin W. W. Parker, inscribed at Clinton, presumably Massachusetts, on April 24, 1850. Presumably William Wheeler Parker, son of Ebenezer Parker and Hannah Brooks (Meriam) Parker, who was a sister to Joseph Meriam, father of album owner Lois Lewellyn Meriam. Lauretta Woodbury of Rindge, New Hampshire; not sure of middle initial. Presumably Lauretta Whitney Woodbury, sister of signer Lucinda Bailey Woodbury. Lucinda Woodbury of Rindge, New Hampshire. Lucinda Bailey Woodbury, sister of signer Lauretta Whitney Woodbury. 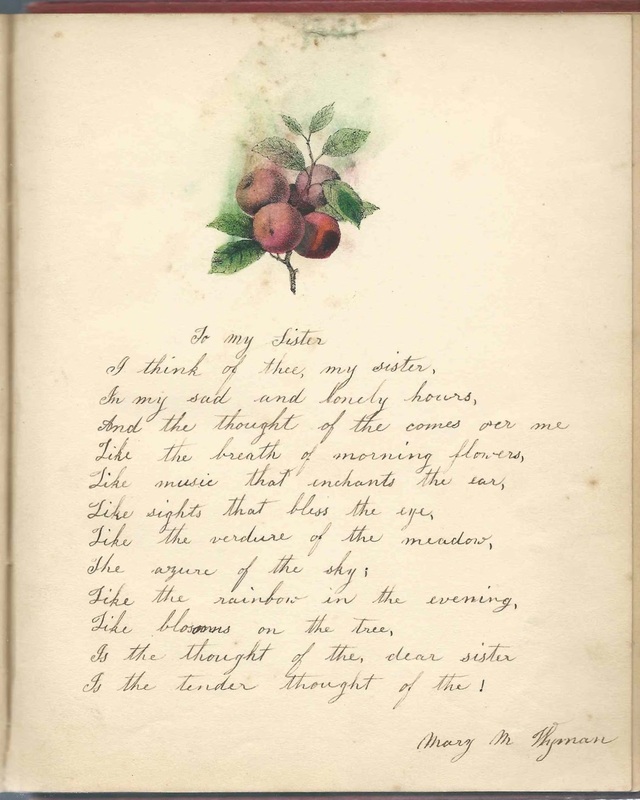 Inscribed "To My Sister" by Mary M. Wyman. She was Lois Lewellyn Meriam's sister, Mary Maria (Meriam) Wyman (born 1821), wife of William H. Wyman. Nellie R. Wyman of Boston, Massachusetts, signed on September 5, 1868; Lois Lewellyn Meriam's niece. Daughter of Mary Maria (Meriam) Wyman and husband William H. Wyman. Emma E. Wyman of Boston, Massachusetts, signed on September 5, 1868; Lois Lewellyn Meriam's niece, daughter of Mary Maria (Meriam) Wyman and husband William H. Wyman. 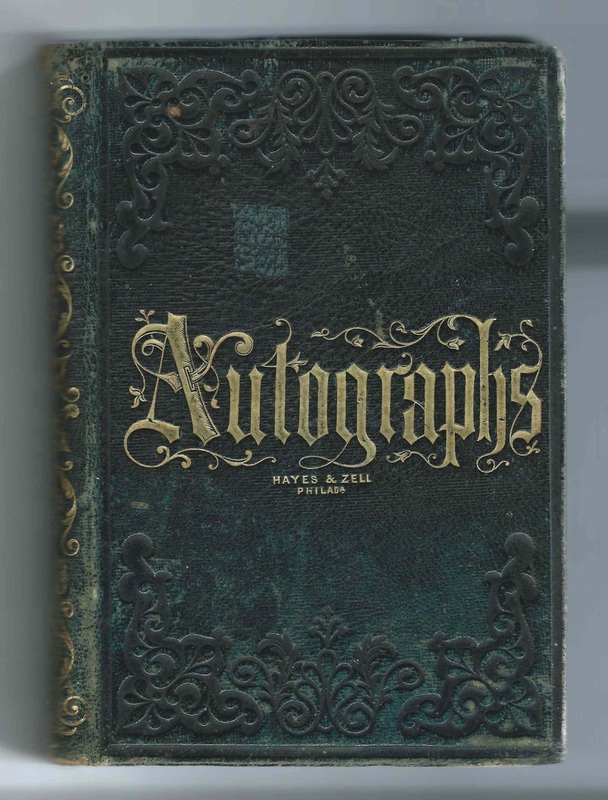 1858-1863 autograph album that belonged to Amanda A. Higgins of Bangor, Maine, and Gray, Maine. She married Thomas Low Libbey of Gray, Maine, in 1866. The album is in rough shape, mostly unbound, and may be missing a few pages, including any ownership or title pages. 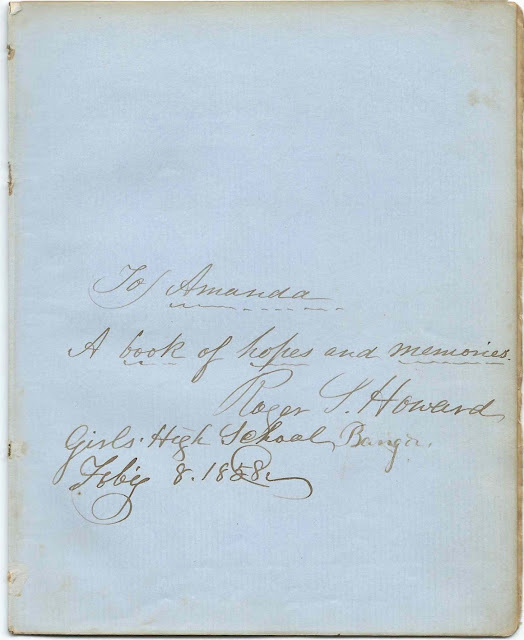 It measures approximately 7-3/4" x 6" and contains the sentiments of about 40 of Amanda's relatives, friends and, possibly, teacher, assuming that Amanda attended Girls' High School at Bangor, Maine, where Roger Strong Howard was then principal. An alphabetical surname list and an alphabetical list of the signers, together with any personal information they offered, appear at the end of this post. Photographs are affixed to three pages. Many of the signers were related by blood or marriage to Amanda or to her husband Thomas Low Libbey, or both. Amanda A. Higgins was born April 11, 1841 at Bangor, Maine, the daughter of Arthur M. Higgins and Catherine L. (Fogg) Higgins. Arthur died in 1849. In March of 1858 Catherine married Jonas Doughty and moved to Auburn, Maine, and then to Gray, Maine. Jonas, a widower, had previously been married to Susan (Fogg) Doughty, perhaps a sister to Catherine. Among the relatives to inscribe pages were Amanda's paternal uncle and his wife, Jefferson Higgins and Elizabeth R. (Emery), "Lizzie". Lizzie used the name "Lizzie Jefferson" but perhaps Amanda had more than one Aunt Lizzie, and this was a way to distinguish which aunt she was. 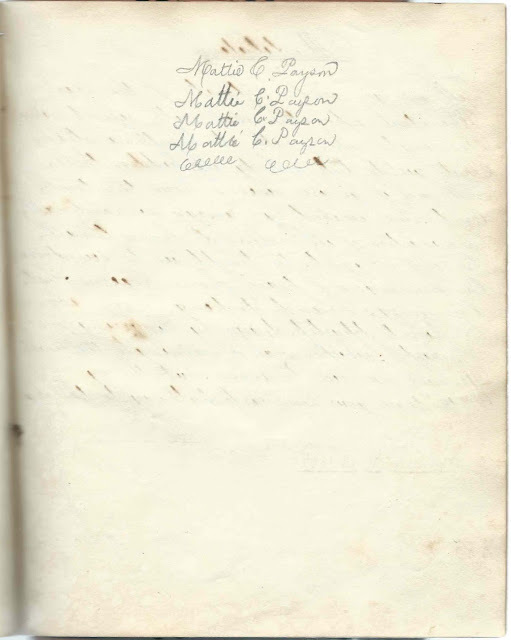 The Cousin Laura who inscribed page on February 12, 1860 was presumably Laura S. Higgins, daughter of Jefferson and Elizabeth R. (Emery) Higgins. I haven't been able to decipher the place where she inscribed the page and would be grateful for any readers' interpretations. It was likely, but not necessarily, at Bangor, Maine. The 1860 Census found Amanda living at Gray, Maine, in another Doughty household, that of Charles Huntington Doughty and wife Emily Jane S. (Furbish) Doughty. It was presumably their son Charles Huntington Doughty, Jr.,who left a sentiment for his "dear Sister". The reference might have been due to the fact that they were living in the same household, or perhaps there was another relationship I missed. On September 9, 1866, according to the "The Libby Family in America: 1602-1881", Amanda A. Higgins became the second wife of Thomas Low Libbey, son of James and Mehitable (Low) Libbey. Thomas' previous wife Sarah M. W. (Oakes) Libbey had died in 1857. Thomas and Amanda farmed at Gray, Maine, and had two children, daughter Katie Libbey, born April 10, 1868, and son Wilbert Thomas Libbey, born October 28, 1870. Thomas died in 1901 and Amanda in 1918. One of the pages with a photograph was that inscribed by composer Solon Wilder at Bangor, Maine, in March 1858. Solon, a chorister with the Congregational Church on French Street, published a book of hymns in 1874. In 1888 he and his family moved to Boston where he took a position with the Conservatory of Music. If you have corrections and/or additions to the information above, or information on any of the signers listed below, please leave a comment or contact me directly. Many of the signers were related, either by blood or marriage, to Amanda and/or Thomas and/or each other. 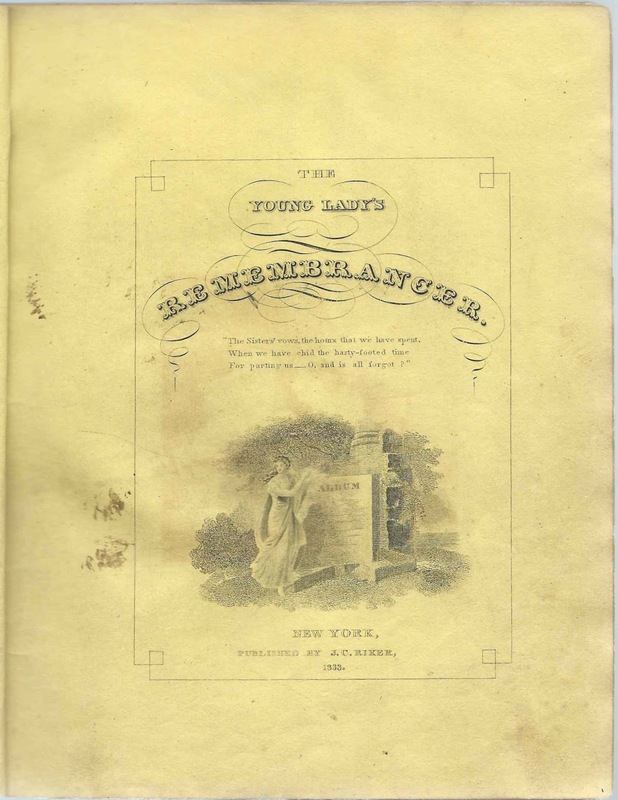 The name T. R. Burnham, written in what looks like a more contemporary hand than the era of the album. 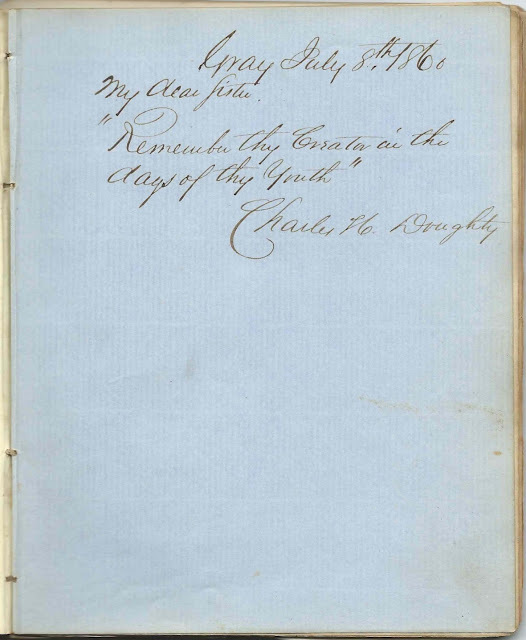 Charles H. Doughty, signed at Gray, Maine, on July 8, 1860; inscribed to "My Dear Sister". Presumably Charles Huntington Doughty, son of the Civil War veteran by the same name. Amanda was living in the Doughty home at the time of the 1860 Census, which is perhaps the origin of the term "Sister" ? S. W. Drummond, signed at Bangor, Maine, on March 17, 1858; inscribed to "sister" Possibly Sarah Webster Drummond, daughter of Alexander and Sarah (Webster) Drummond. Not sure about sister relationship. Amanda, album owner Amanda A. Higgins; nicknamed "Mandie"
Uncle Reuben, presumably Reuben Higgins, brother of Amanda's father Arthur M. Higgins; signed on May 1, 1859. Either he inscribed two pages on the same date, or his son inscribed one, but they were both inscribed by "Uncle Reuben", so the father seems more likely. Aunt Mary; possibly Mary Higgins, sister of Amanda's father Arthur M. Higgins. 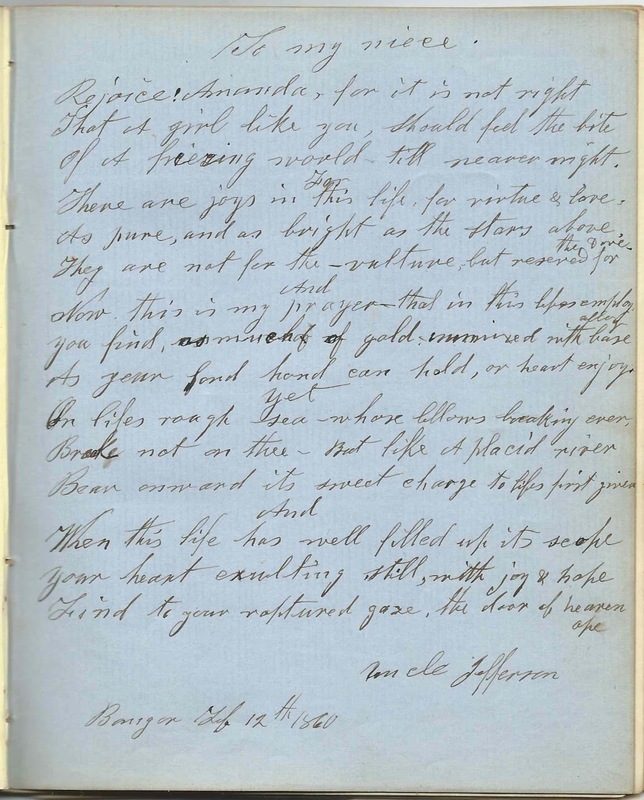 Uncle Jefferson, signed at Bangor, Maine, on February 12, 1860. Presumably Jefferson Higgins, a brother to Amanda's father Arthur M. Higgins. "Sister Marion". Amanda's sister Marion H. Higgins, who married James Freeland Newman in 1875. Cousin Charlie, signed in July 1859. Possibly Charles Melville Higgins, son of Jefferson and Elizabeth R. (Emery) Higgins. Jefferson was a brother to Amanda's father Arthur M. Higgins. Cousin Laura, signed at ? Hill, on February 12, 1860. Her photograph affixed. Presumably Laura S. Higgins, daughter of Jefferson and Elizabeth R. (Emery) Higgins. Jefferson was a brother to Amanda's father Arthur M. Higgins. 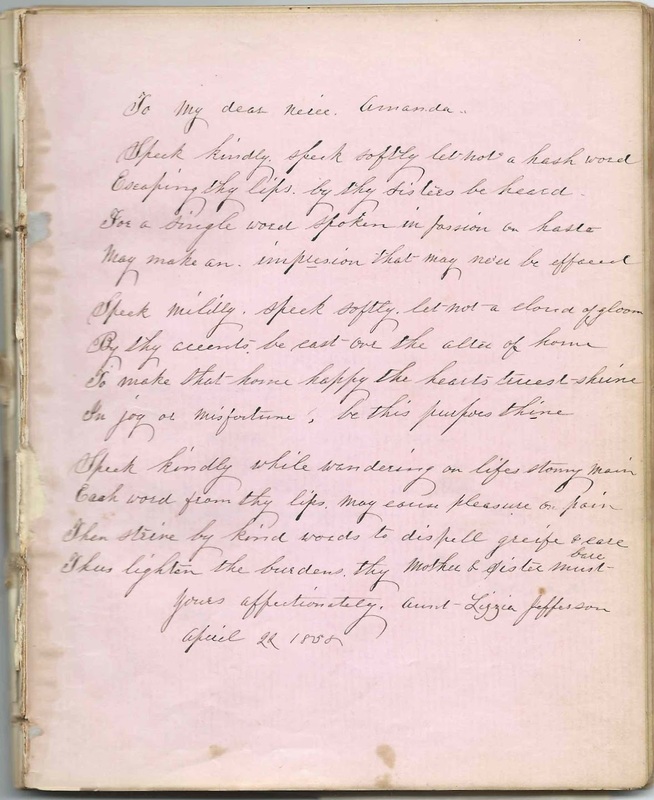 Aunt Higgins, signed at Bangor, Maine, in March 1858. Presumably the wife of a brother to Arthur M. Higgins, but not Jefferson, whose wife was Lizzie. Aunt Lizzie Jefferson, signed on April 22, 1858. Presumably Elizabeth R. (Emery) Higgins, wife of Jefferson Higgins; not sure why she wrote her name the way she did, unless there was more than one Aunt Lizzie. Roger S. Howard, Girls' High School, Bangor, Maine, signed on February 8, 1858. Roger Strong Howard (1807-1880), Principal of Girls' High School. W. H. V., signed at Gray, Maine, on August 1, 1860. Not sure of middle initial. Solon Wilder, signed at Bangor, Maine, in March 1858. His photograph affixed. 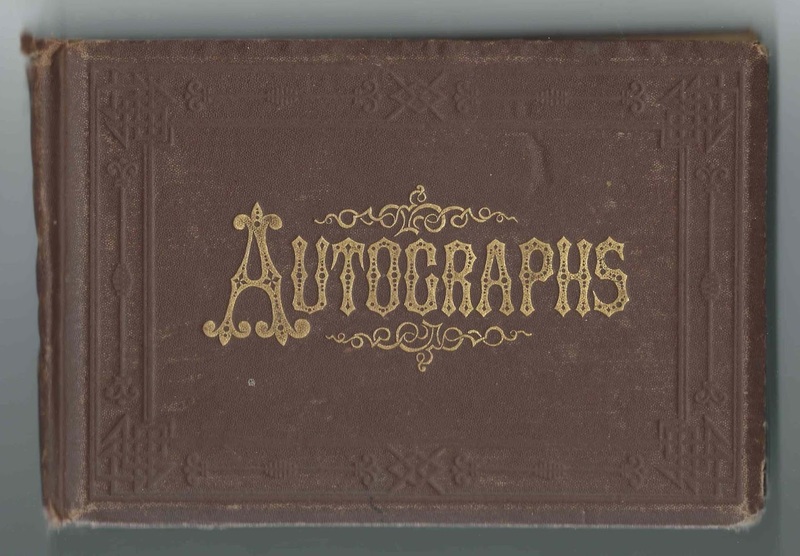 1869-1874 autograph album that belonged to Olive Amelia Scott of Scottsmore, Dunham, Quebec, who moved to Massachusetts, where she married Owen Burnham Ingalls of Bridgton, Maine. Many of the signers had an association, either as patient or staff, at McLean Asylum at Somerville, Massachusetts, now known as McLean Hospital and located at Belmont, Massachusetts. It's likely that a few pages, perhaps just limited to the end papers, are missing, including a title page and any page that Olive herself might have inscribed. 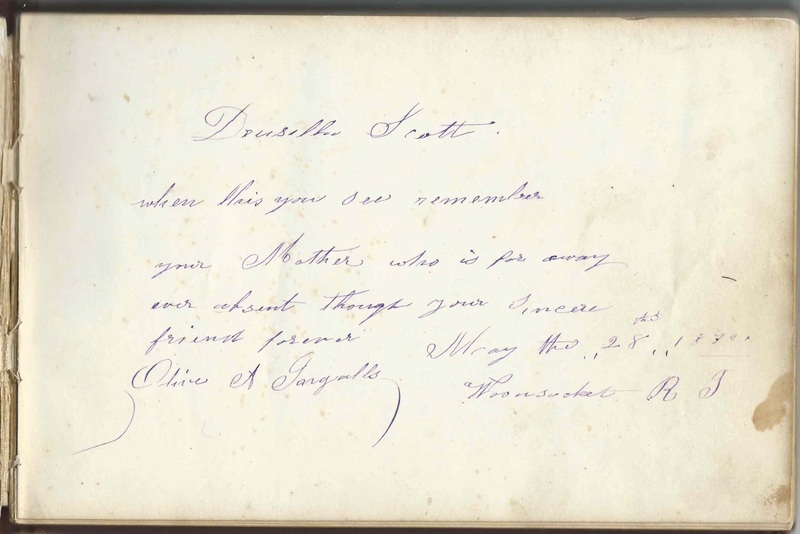 The first page of text is the page inscribed by Olive's mother, Drusilla (Pettes) Scott, on May 28, 1872 [not sure of last digit] at Woonsocket, Rhode Island, after Olive's 1870 marriage to Owen Burnham Ingalls. 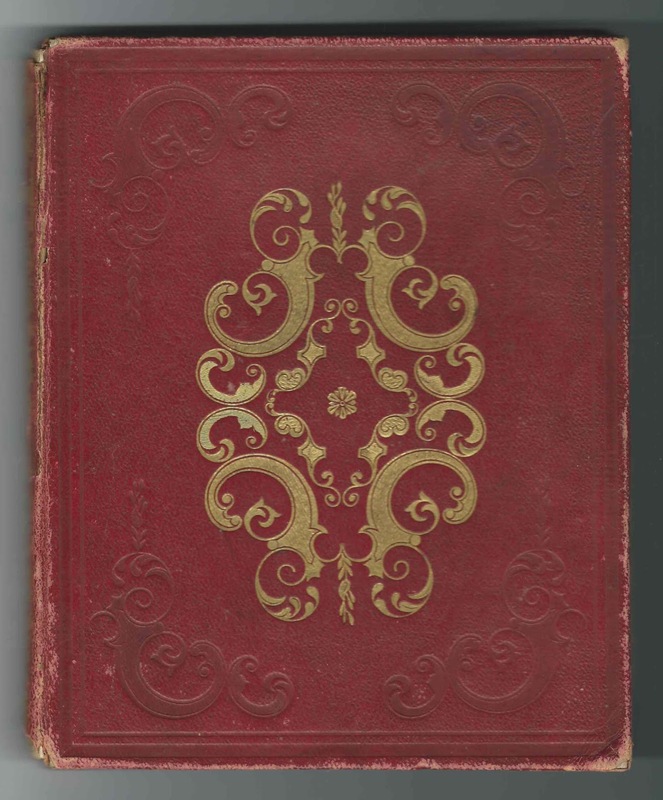 The album measures approximately 8" x 5-1/4" and contains the sentiments of about 74 of Olive's relatives and friends. As noted above, many of the signers were associated with McLean Hospital, either as staff or patients. An alphabetical surname list and an alphabetical list of the signers, together with any personal information they offered, appear at the end of this post. Other relatives and in-laws inscribed pages; refer to the list of signers below. 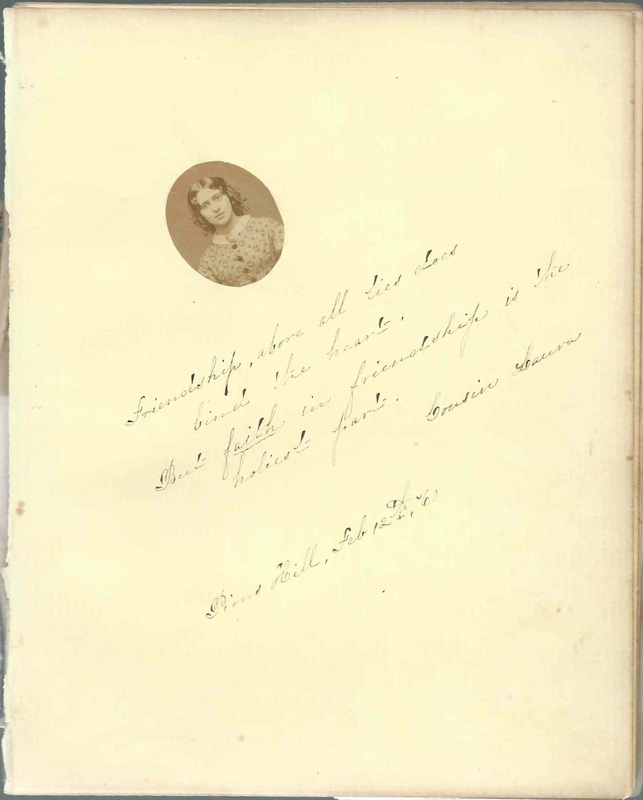 Entries in Olive's autograph album show she was in Massachusetts, at least as early as 1869, presumably either working at McLean Hospital or a patient there. On January 3, 1870, either at Blackstone, Massachusetts, or Somerville, Massachusetts, Olive married Owen Burnham Ingalls, son of Joseph Lindsay Ingalls and Amanda (Church or Hale) Ingalls. Owen was born November 4, 1844 at Bridgton, Maine. Olive and Owen perhaps first met at McLean Hospital, where Owen left a sentiment in Olive's album on March 14, 1869 and gave his residence as North Bridgton, Maine. 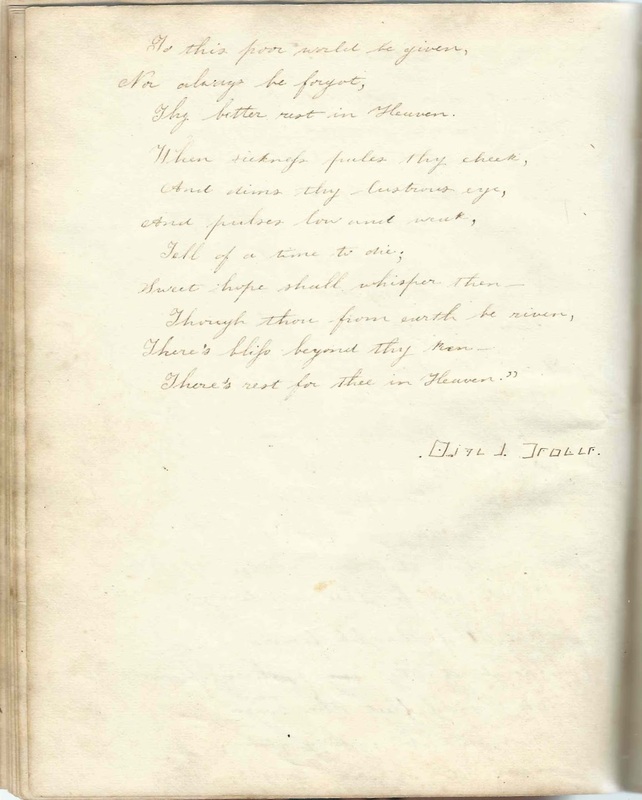 Owen may have come initially to Somerville because his sister, Julia Amanda (Ingalls) Record was living there with her husband, Horace Record, both of whom inscribed pages in Olive's album. The 1870 Census of Blackstone, Massachusetts, shows Owen as a machinist and Olive as working in a cotton mill. By 1875, they were living at Woonsocket, Rhode Island, with son Linton Pettes Ingalls, who was born May 24, 1872. By 1880 Owen and Olive were living on the home farm at Bridgton, Maine, or North Bridgton, with Linton and daughter Stella Ethel Ingalls, who was born October 21, 1876. Sadly Olive died at Bridgton, Maine, on November 21, 1882. I found records showing her buried at Forest Hill Cemetery at Bridgton, Maine, and at Scottsmore Cemetery at Dunham, Quebec, where she's listed on the stone of her parents, but perhaps isn't buried there. About 1886, Owen married Elizabeth Staley, who was born at Leeds, England, on August 24, 1867. They had a daughter Edna Gertrude Ingalls, born October 15, 1887. Owen died in 1925 at Bridgton, Maine. One inscriber was McLean Asylum supervisor Elbridge Smith Upham of Saugus, Massachusetts, who left a sentiment on March 13, 1869. E. D. I., signed on November 19, 1869; not sure of surname initial. Aunt Anna of what looks like Broom C., Quebec, but might be Brome County, Quebec. Rutharia Bates, signed at the McLean Asylum at Somerville, Massachusetts, on October 7, 1869. Patient. Teacher in Cambridge, Massachusetts, schools. James B. Cofran of Northfield, New Hampshire, signed at Somerville, Massachusetts, on March 7, 1869. Aura A. Cofran of Northfield, New Hampshire, signed at Somerville, Massachusetts, on March 6, 1869. Mary N. Henderson of Moncton, New Brunswick, signed at Somerville, Massachusetts, on March 8, 1869; inscribed to "Sister Olive"
Owen B. Ingalls of North Bridgton, Maine, signed at McLean Asylum on March 14, 1869. Owen Burnham Ingalls, who would become Olive's husband about 1870. Julia M. Porter of New York [not sure of state], signed at Somerville, on April 3, 1869. Presumably Somerville, Massachusetts. Julia A. Record of Harrison, Maine, signed on September 15, 1869. Julia Amanda (Ingalls) Record, wife of Horace Record and sister of Olive's husband Owen Burnham Ingalls. N. L. S., signed at Scottsville or Scottville, on January 9, 1870; presumably in Quebec. Possibly Olive's sister Narcissa Lavina Scott. Melvin N. Scott of Sutton, Quebec. Melvin Nathaniel Scott, Olive's brother. Anna Scott of Dunham, Quebec; possibly Anna Catherine Scott, Olive's youngest sister. Miss Anna Scott of Dunham, Quebec, signed on January 9, 1869; possibly Anna Catherine Scott, Olive's sister. Mr. E. L. Scott of Scottsville, Quebec. Presumably Olive's brother Egbert Linton Scott. Elvira Scott, signed at Iron Hill, Brome, Quebec, on January 8, 1870. Presumably Elvira (Pickle) Scott, wife of signer Ira Scott. Mrs. Emily L. Scott of Sutton, Quebec, signed on January 14, 1870. Olive's sister-in-law Emily Lucinda (Hubbard) Scott, wife of Olive's brother Melvin Nathaniel Scott. Florence D. Shufelt of East Farnham, Quebec. She spelled her town as East Farnaham. Her mother, Sarah (Pettes) Shufelt and Olive's mother Drusilla (Pettes) Scott were sisters. Jerusha Shufelt of East Farnham, Quebec. Presumably Jerusha (Brimmer) Shufelt, second wife of Hiram Shufelt. Hiram Shufelt of East Farnham, Quebec. His first wife Sarah (Pettes) Shufelt was a sister to Olive's mother Drusilla (Pettes) Scott. William A. Shufelt of Brome, Quebec. Presumably William Arthur Shufelt, son of Cyrus Cleveland Shufelt and Mary (Pettes) Shurfelt. Mary was a sister to Olive's mother Drusilla (Pettes) Scott. Forrest Shufelt of Brome, Quebec; possibly Thomas Forrest Shufelt, son of Cyrus Cleveland Shufelt and Mary (Pettes) Shufelt. Mary was a sister to Olive's mother Drusilla (Pettes) Scott. John D. Shufelt; presumably John David Shufelt, first husband of Olive's sister Hattie Drusilla (Scott) Shufelt McCrum. 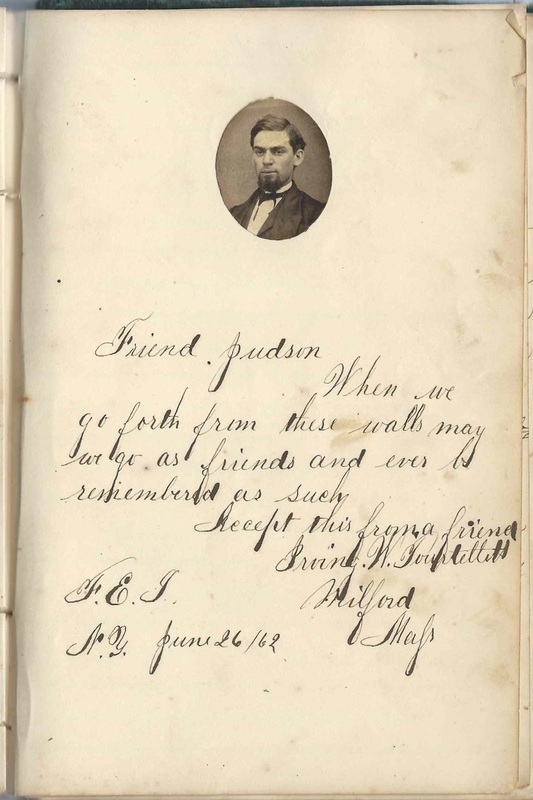 1859-1862 autograph album of Lucius Judson of Guilderland, New York, with autographs collected while he was a student at Fort Edward Collegiate Institute at Fort Edward, New York. 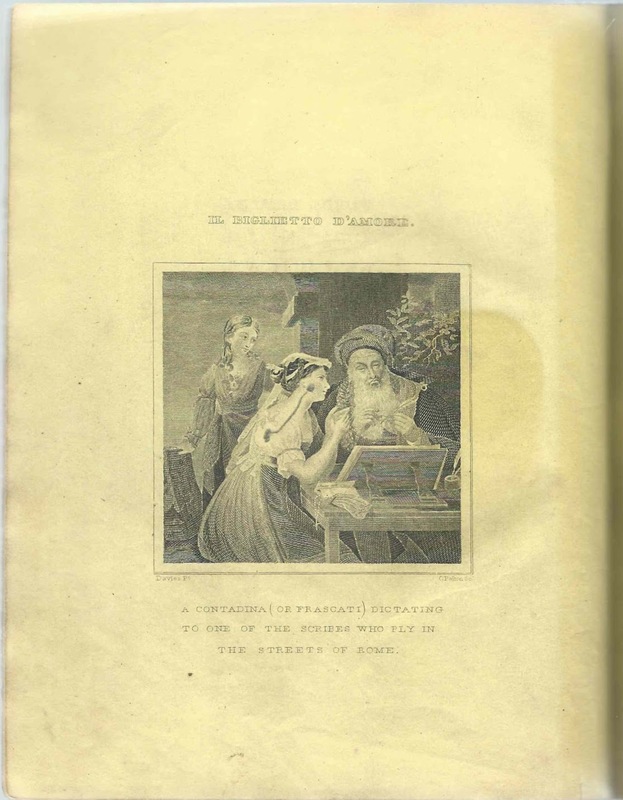 As you can see on the ownership page below, the name J. H. Lansley appears in the lower right corner; perhaps it was he who gave the album to Lucius. 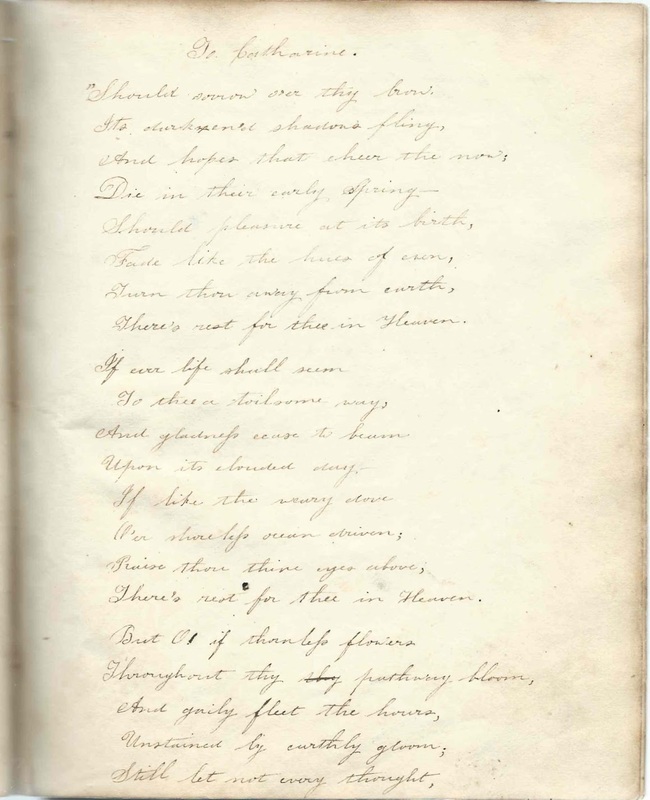 J. H. Lansley inscribed a page later on in the album as well. 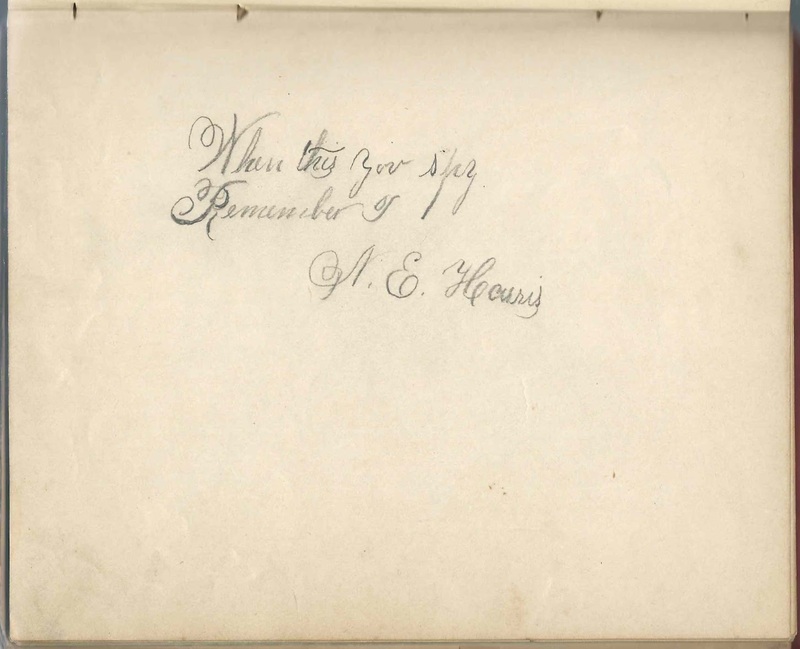 The album, printed by Hayes and Zell of Philadelphia, Pennsylvania, measures approximately 7-1/2" x 5-1/4" x 1" and contains the sentiments of over 100 of Lucius' friends, instructors and schoolmates at Fort Edward Collegiate Institute, nine of whom affixed photographs to the pages they inscribed. The Old Fort House Museum, operated by the Fort Edward Historical Society, has Fort Edward Collegiate Institute catalogs for the years during Lucius' attendance, in case you recognize a name from the list below and would like to have a copy of that page. My thanks to them for identifying two of the signers as the Principal and a teacher at the Institute. 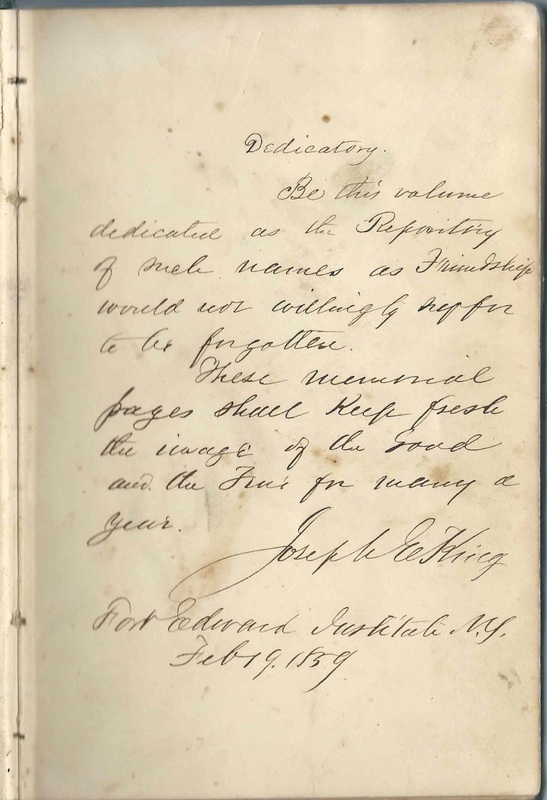 Joseph E. King, Principal of the Fort Edward Collegiate Institute, inscribed a page at the Institute on February 19, 1859. 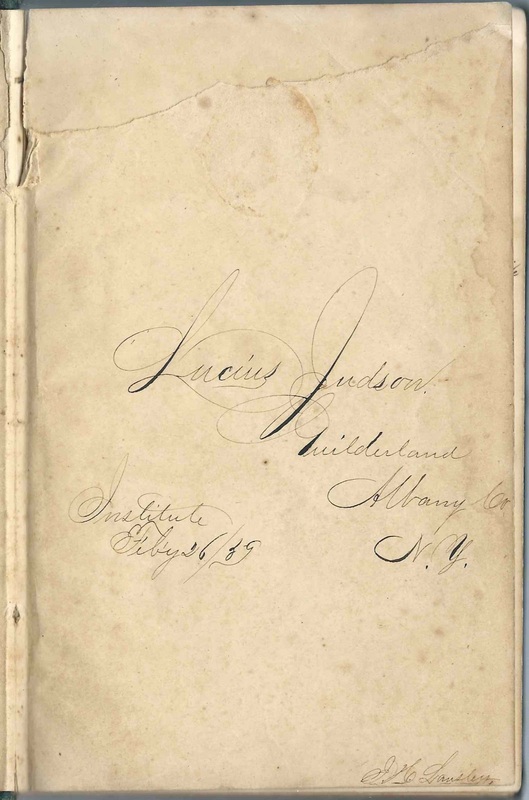 Lucius Judson was born at Albany, New York, on July 4, 1843, the son of Albert C. Judson and Mary C. (Hotchkiss) Judson. After leaving Fort Edward Collegiate Institute, Lucius studied law, as indicated in an 1864 Albany, New York, city directory, which lists Lucius as a law student there. Lucius was an attorney and prosecutor at Salem, Missouri. The Judson home is part of Salem's Historical Walking Tour, which has photographs of Lucius and Mary and their home. 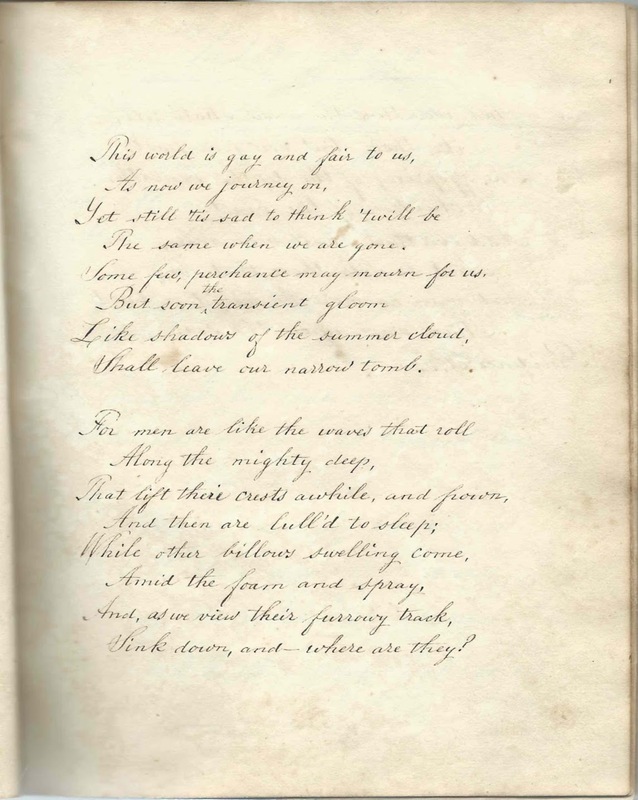 Irving W. Tourtellett of Milford, Massachusetts, inscribed a page at Fort Edward Collegiate Institute on June 26, 1862. I found records of him online that had his surname variously as Tourtellott and Tourtellotte. Abel Adams of Bedford, Canada East, presumably in the Province of Quebec, signed at Fort Edward Institute on June 18 [no year written]. Not sure of surname. M. A. Arnold, signed at Fort Edward Institute, on June 23, 1859; not sure of first initial. 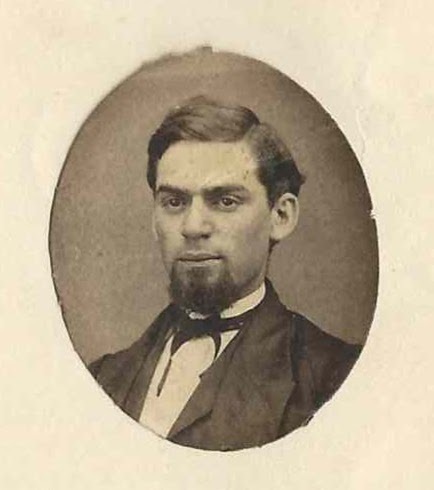 Alphonso Bixby, signed at Fort Edward, New York, on June 24, 1862; student at Fort Edward Institute; he affixed a photograph. John Brown of Middletown, New Jersey [or ? 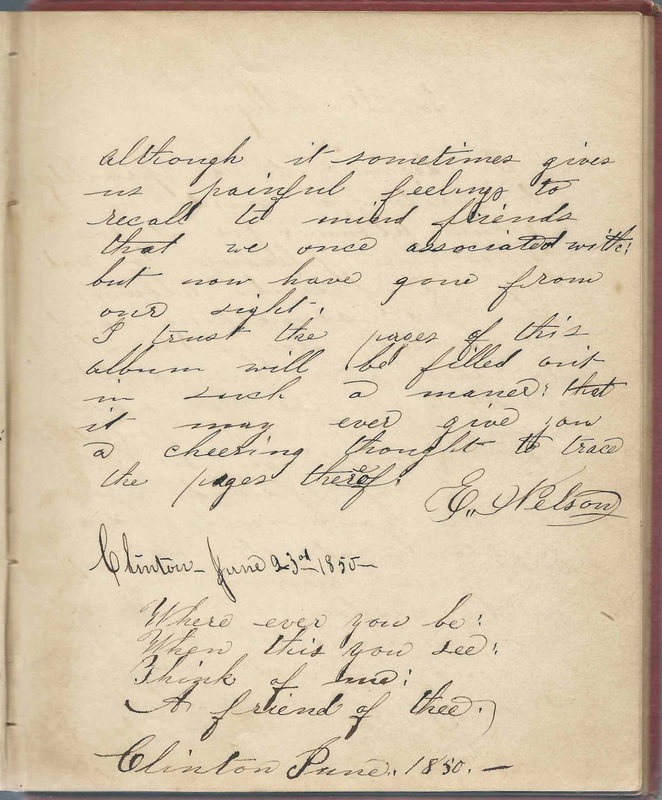 ], signed on June 20, 1859. Middle initial might be G or L or ? C. A. Burr, signed at Fort Edward Institute on July 1, 1862; he affixed his photograph. S. C. C ? 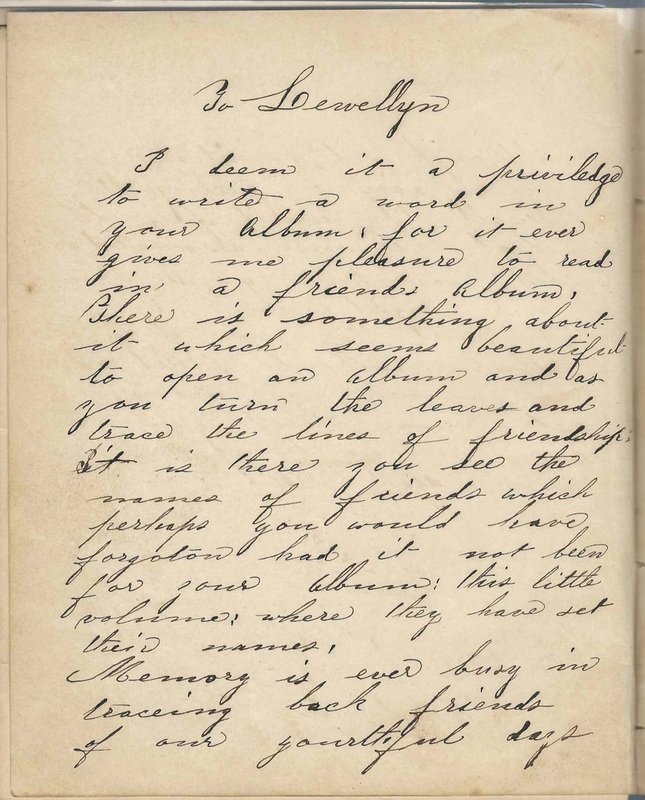 of West Troy, New York, signed at Fort Edward Institute, on March 7, 1859; "your friend and brother Senator"
? B. Derrickson of New York, signed at Fort Edward Institute on July 2, 1862, Spring Term. He affixed his photograph. Possibly Vincent B. Derrickson. 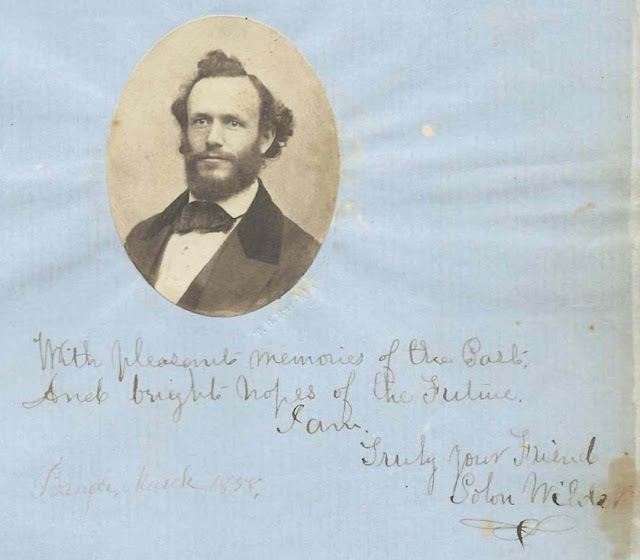 M. I. French, or M. J. French, of New York City, signed at Fort Edward Institute on June 30, 1862; photograph affixed. F. M. Hamlyn of Auburn, New York, signed at Fort Edward Institute on June 29, 1862. He affixed his photograph. A. K. Haxston, signed at Fort Edward Institute on February 28, 1859; not sure of surname. Robert W. Jones of Bethlehem, Pennsylvania, signed at Fort Edward Institute on June 6, 1859. Shared the page with John J. ? Lucius Judson of Guilderland, New York; album owner; started his album at the Institute on February 26, 1859. The page has the name J. H. Lansley in the lower right corner. Perhaps this person gave the album to Lucius. Joseph E. King, signed at Fort Edward Institute, on February 19, 1859. Principal of the Institute. J. H. Lansley of Albany, New York, signed at the Institute, presumably Fort Edward Institute, on March 1, 1859. 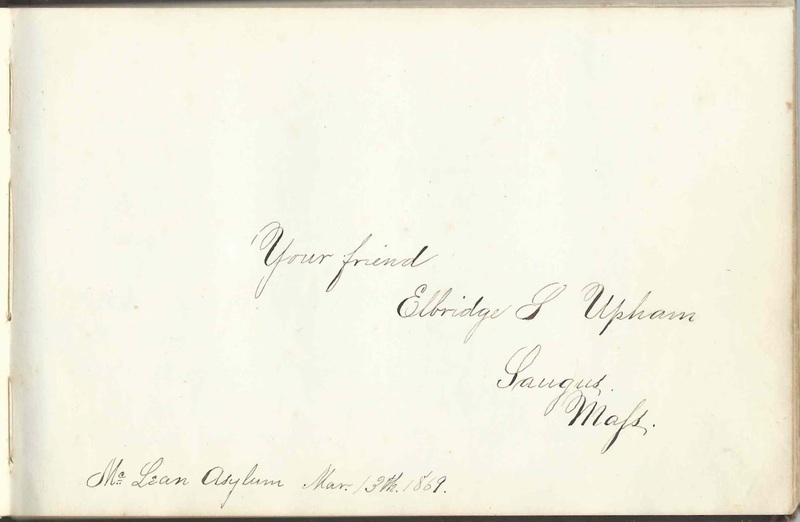 Name also appears in the lower right corner of the ownership page; might have given the album to owner Lucius Judson.
? B. Martin of Elizabethtown, Pennsylvania, signed at Fort Edward Institute on July 1, 1862. Given name initial might be Q or I or J or L or ? Albert C. Niver of Ancram, New York, signed at Fort Edward Institute on June 16, 1862. He affixed his photograph. William F. Rockwell of Ridgefield, Connecticut, signed at Fort Edward Institute on July 1, 1862; his photograph affixed. James H. Schoonmaker of Cedar Hill, New York, in Albany County. S. M. Stoddard of Deckertown, New Jersey, in Sussex County, signed at Fort Edward Institute on July 1, 1862; he affixed his photograph. A. C. Works, signed at Fort Edward Institute on February 19, 1859. Adam Clark Works, a teacher at the Institute.